Dr Ruth Massey, from the Department of Biology and Biochemistry at the University of Bath, said extra vigilance was required around this and similar MRSA bugs known as PVL-positive community acquired strains. USA300 is resistant to treatment by several front-line antibiotics and can cause large boils on the skin. In severe cases, USA300 can lead to fatal blood poisoning or a form of pneumonia that can eat away at lung tissue. Dr Massey said there were 1,000 cases of PVL-positive community acquired MRSA in England in the last year, of which 200 were USA300 strains. ‘These community-acquired strains seem to be good at affecting healthy people – they seem to be much better than the hospital ones at causing disease. Dr Massey said USA300 is ‘a really big issue in the U.S. and it’s starting to emerge here. In a new research paper published in the Journal of Infectious Diseases, Dr Massey and colleagues analyse the way community-acquired MRSAs are able to adapt and fine tune themselves to spread outside of hospitals. MRSA bacteria in hospitals has not been able to migrate into the community in the same way. Dr Massey said: ‘Our research found that the composition of the cell wall of the bacteria is critical to the community-acquired bacteria being more toxic. 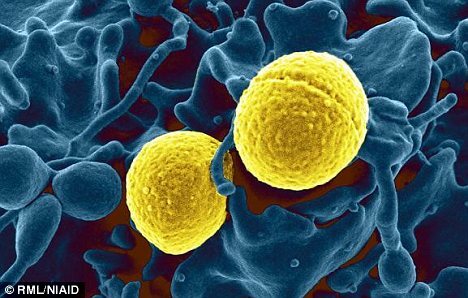 ‘The ability of the MRSA bacteria to secrete toxins is one of the main ways it causes disease. ‘Using a sensing system, it carefully controls when it switches on its ability to do this, so as not to cause disease until it is firmly established within the human.